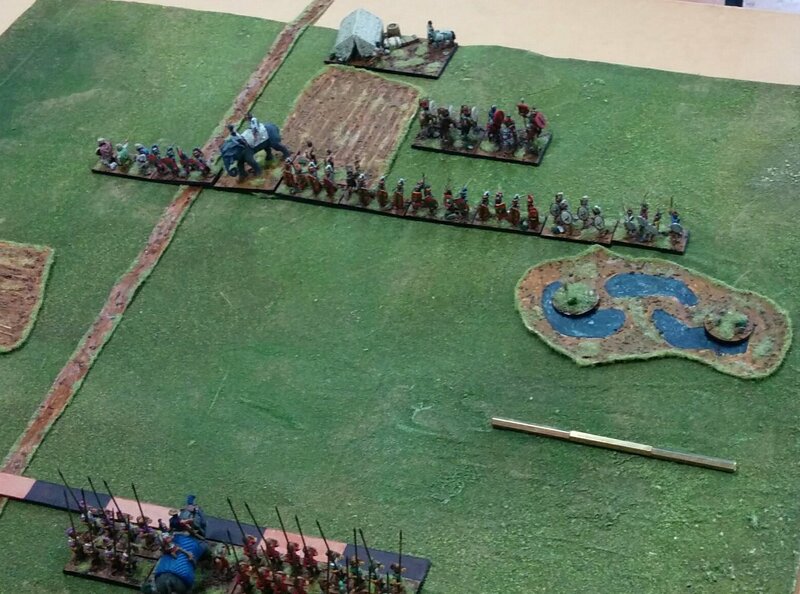 Sunday a week ago there was a very successful DBA day at the Auckland Wargames Club. As it led to other projects being planned, I’ve not got around to writing up any report until now. The format was friendly games; no set armies or points. I had five very enjoyable games. My first game was against John, whose army is still being painted, so he borrowed figures from me. I’m pleased to say that they knew who their paymaster was, and fought accordingly! A bird’s-eye view of the Marian Romans. I was the defender and laid down some Marsh and ploughed fields (I’d just made some new terrain; I realised later that Marsh is not valid for Arable armies). Appropriate to the weather that day the fields were boggy. The Romans, complete with an elephant. Alexander, or his subordinate, took an elephant as well. He swung his knights out on his left flank. 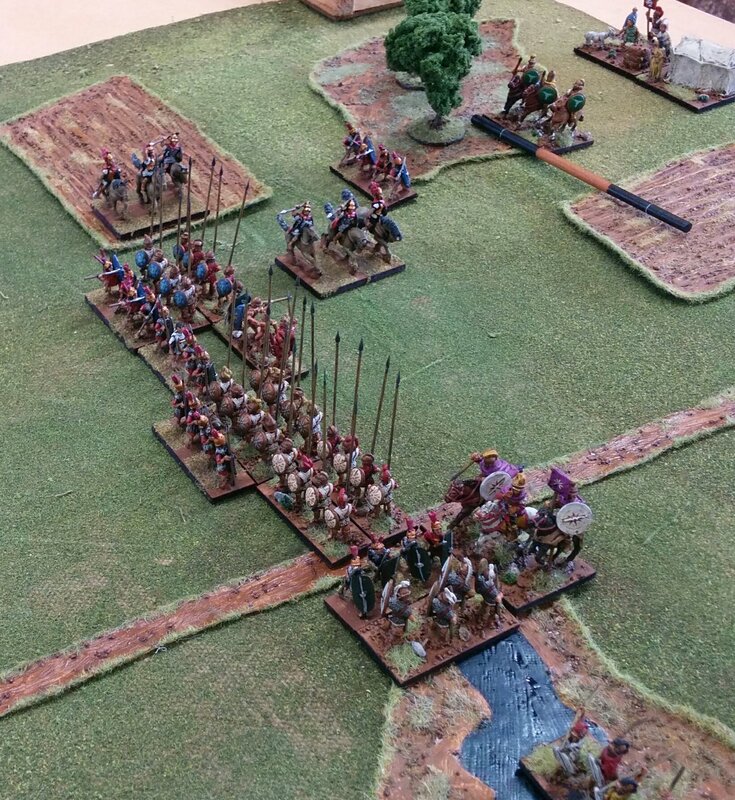 Things looked good when one squared off against some auxilia, who promptly 6-1ed him! It went from bad to worse from there with the general encountering elephants and this time the encounter went to script. The Kappadocian hillmen notched up their second kill, supporting some legionaries against hapless thureophoroi, and it was all over. The situation at the end. Not a single companion cavalryman left! The surprising resilience of the Kappadocians secured a quick victory. The second combat was against Kieran’s Vikings. Again I was the defender and went for a marsh and a wood, which ended up being in the same corner. The Viking invaders of Scotland. The defenders of Scotland (helped by some friendly Vikings on their right flank. The battle was a close one, where the Scots won first blood, when the Galwegians broke an element of Vikings. However, the centre was somewhat of a stalemate, with a lot of toing and froing. On the Scots’ right their Viking allies did good execution and contributed to a close-fought 4-2 victory. Terrain and the greater mobility of the Scots were significant factors. 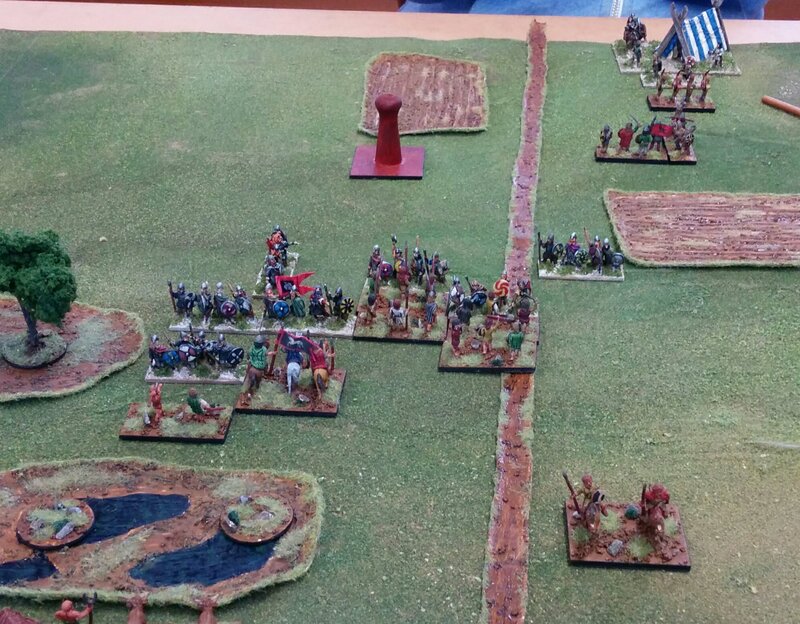 The finals situation; the wood has saved the fragile Scots left flank. Their Viking allies have hared up the field on the right flank, while a schiltron has collapsed in the centre. After lunch I faced Joel’s freshly painted Polybian Romans. I decided I really should get my Later Macedonians out to meet them. Naturally in the face of unprovoked Roman aggression I was the defender again. I took two large terrain pieces to anchor my flanks and restrict the battlefield to the advantage of the phalanx. 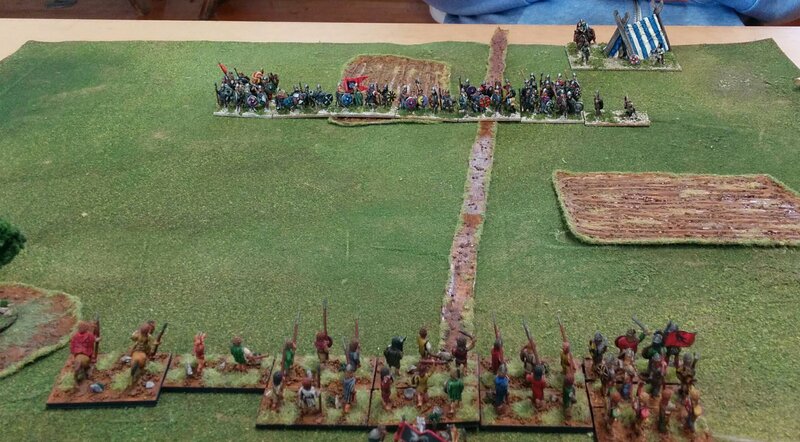 The valiant Macedonians line up to hold Roman depredation at bay. Scurrilous Romans set on spreading tyranny. The battle was close fought, with the battle going in the Romans’ favour on their left flank, while the Macedonians secured the advantage on their own left flank, destroying both elements of Roman velites. However, it was the steadfastness of the Macedonian blueshields that secured victory; despite being flanked by Roman cavalry they repeatedly refused to break. In the centre the Galatians made noble execution of Roman legionaries and the whiteshields (leukaspides) broke their opposing legionaries. The situation at the end; the Macedonian right flank is lucky not to have broken after their light horse fled, but the centre has triumphed. Actually, there is a report that prior to this battle the Macedonian general was troubled by a nasty dream in which his thureophoroi proved his undoing. Romans report that this was an actual battle, but the more reliable Greek chronicler disagree (the battle just described was actually our second, as the first was over so fast!). The Macedonians defended again. Their terrain was too small to constrain the battlefield. The Macedonian thureophoroi attempted to defeat the Roman velites and were disgracefully defeated (they are prone to this; witness their routing by Spartan artillery). Philip V tried to stabilise things, but was defeated himself; the battle was over without the main lines having contacted. The final position. The thureophoroi were quickly routed and Philip was flanked and defeated. There was a scary big hole in the Macedonian line. The last battle was against Mike’s Carolingian Franks. The Scots had got on their boats and visited France. It didn’t go well for them. The Carolingian Franks. The red beads denote those that can dismount. How the Galwegians got to be in the centre facing knights I don’t remember (I think I deployed and then moved the line along a bit to fit it in the legal area and didn’t check who was facing who. Unlike the bold Kappadocians at the start of the day, the Galwegians didn’t produce an upset against the Carolingian commander. The schiltons were under pressure and collapsed, but not before a few knights had fled in the face of the Scots cavalry. The final situation after the Scottish centre had collapsed. All in all, it was a great day; there is another account of it here, and there are plans for more DBA action there soon. Excellent report Mark. The figures look good as does the terrain. It’s always good to see a range of armies in play. Thanks very much. I had a lot of fun using armies I haven’t had out in a while.